I posted earlier about things that fill us and have the potential to take us away from the close fellowship with God we should have. One such area that has always been a temptation for me is technology. I’m a tech geek. I have been for as long as I can remember. Technology can very easily distract us from the things that are truly important, but it doesn’t have to. If viewed properly, technology can be redeemed for use in God’s kingdom. In particular, I have found the rising popularity of smartphones and tablets to be wonderfully beneficial. Anyone with such a device has almost immediate access to the Bible in scores of different English versions, plus hundreds of other languages, not to mention all the commentaries, dictionaries, and other such resources available. It has become one of my personal passions to see modern technology used in the spread of the good news. 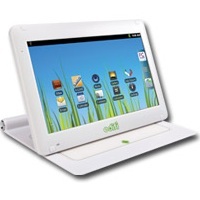 That said, I was not really sure what to think when I heard about Edifi, the “Christian” Android tablet. Cheesy advertising aside, my first thought was, “What’s the point?” Is it really helping anything to just relabel a secular product as “Christian” and sell it as such? But then again, looking at the specs, it should be a decent tablet for an affordable price, and I don’t mind that it comes preloaded with a few “Christian” apps. In fact, compared to its primary competitors, the Kindle Fire and the Nook, it looks like the Edifi tablet should actually be less locked down with proprietary software, and it’s cheaper to boot. However, the deal-breaker for me is the screen, with a resolution of only 480 × 800 pixels, and resistive touch at that. Though if you’re looking for a tablet on a budget, it might be worth checking out. Well, seeing that it is being touted as a “Christian” tablet, some friends and I got to wondering about how such a device could be saved. One proposed that Android was saved early in life and had backslidden, this just being the rededication of his life. Another stated that Android (being only in the form of a human) must surely align himself with the docetist sect. We then wondered about how a tablet could be baptized. At first, we said that Android would simply have to accept his death upon immersion; however, I suggested that he was probably a Presbyterian tablet, having already been baptized by sprinkling as an infant. Then someone chimed in with the thought that Android probably converted from Presbyterianism to Pentecostalism upon his rededication, being now baptized by the Spirit, with the gift of providing translations for tongues. Yeah, we’re just weird like that. All joking aside, it does bring up an interesting question. Why are we so quick to give the “Christian” label to things? In today’s vernacular, we have “Christian” books, “Christian” movies, “Christian” television, “Christian” music, “Christian” radio, “Christian” schools, and now “Christian” tablets. Does not Christian define a follower of Christ? How then can any inanimate object choose to follow Christ? Now of course I know what we mean by it, and I use the term in such a manner as well. Still, it’s good to stop and think about what we’re saying every now and then. “Only God Is Awesome!” … Really?